This is your one stop spot for all things Dragon Age Keep! The links below will take you to either articles on Help.EA.com or guides posted originally on the Bioware forums. When saving your world state to 'Editable States,' you can also rename the playthrough and add a description if you wish. This will help differentiate your playthrough from others in this section. Once your state is in 'Editable States,' drag and drop it to the top slot and select 'Edit in Tapestry.' Or, click on the world state and press 'Load in the Keep.' After, you can go back to the tapestry and scroll to the right to see the DA:I portion. Depending on the playthrough you loaded, you may not see all the tiles in the DA:I tapestry at first. The spoiler gates are designed to remain in place until you complete a plot or quest. For example, if you romance a character, the romance tile will remain hidden until you finish the romance (at or near the end of the game). 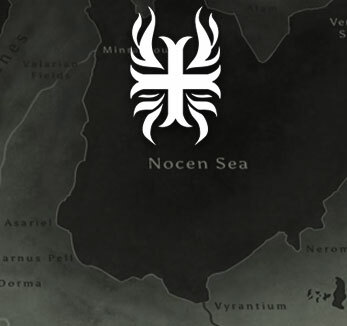 Depending on the choices you made while playing Inquisition, each plot or quest may only have one tile visible (representing the choice you made), while the other tiles are hidden. You'll be able to see if a plot has other options, but you won't be able to see what those options are. You also can't click the context '?' button until you have completed all choices for a particular plot or quest. It is possible to click on a tile for a plot you have yet to complete, but you'll only be able to see the number of choices that exist. The tiles will remain unreadable until you complete the plot in-game. If you'd rather see all the tiles without the spoiler gates, you can do that now! Click the globe icon in the upper right corner of the Keep. Then, go to the gear icon. You'll see a 'Show' or 'Hide' option for spoilers. Adjust at your own risk! I have a fully completed playthrough, but some of the tiles are still hidden. What can I do? Please double check to ensure your PC or console is connected to the internet and logged in to the same EA (formerly Origin) account you're using for the Keep. Then, load up the last save made for this particular playthrough. You may have to wait some time, but it should appear in the 'Current Playthrough' slot in the 'Playthrough States' section. Once that's done, follow the steps above to get your playthrough into the tapestry. How can I see all the tiles? What if I haven't finished the plot/quest that's on the top level of the tapestry? Can I still see the other tiles in that section? Yes. You can still click on a top-level tile if it's marked as 'Hidden.' This will take you to the second level of the tapestry, when you'll be able to see the plots or quests you completed that are part of that section in the Keep. The Heroes section will show your default and custom heroes from Dragon Age: Origins, Dragon Age II, and Dragon Age: Inquisition. You can view these heroes by opening the Heroes menu in the upper left corner of the Keep. Once in the Heroes section, you'll see tiles corresponding to each title in the Dragon Age series. To find your hero, select the game they come from. Use the filters at the top of the screen (under the header bar) to view each hero by gender, race, class, or origin. You may also toggle between showing default or custom heroes using the check box. Click on any hero's portrait to see a more detailed view of that character. A red flag icon on a portrait indicates that hero is assigned to a world state. You can see which world state by clicking on the hero. If you have unused custom heroes in any of the Dragon Age games, you can delete them using the Keep. Click on the portrait of the hero you'd like to delete. A pop-up will appear giving the option to delete this hero. Once a hero is deleted, there's no way to get them back. Click yes to confirm deletion, and no to cancel. If you're having difficulty syncing custom heroes to the Keep, you can add your own personal touch to a default hero by editing their backstory, name, and thumbnail image. Once in the Heroes section, select a game. Please ensure you have checked the 'Default Heroes' box at the top of the screen to view default heroes. Click on the portrait of the hero you'd like to customize. To change a hero's name, click on the pencil icon next to their name. Please make sure to click the check mark icon to save your hero's new name. To change a hero's thumbnail image, click on the thumbnail. This will open a new pop-up. Once you're satisfied with the placement of the image, you can hit save to keep your changes or reset back to the default thumbnail. You can edit your hero's bio by clicking the pencil icon next to it. Customize their story by adding their accomplishments, childhood story, or by recounting their heroic deeds. It can be as long or as short as you like! Don't forget to hit the check mark to save when you're finished. Any saved changes you've made to your heroes will appear in the Keep. To help make the Keep more of a reflection of your unique Dragon Age story, you can also edit your custom heroes. Add a thumbnail that reflects the hero's in-game image. Change their bio to reflect their actions in the game, or write your own headcanon. Don't forget to hit the check mark to save. You can also edit their name (please note that this will not change their name in the game). The Tapestry represents all the choices you've made in the Dragon Age series, from Origins to Inquisition. Using the Tapestry, you can customize up to 10 unique world states. Choices in the Tapestry are grouped by theme (eg. Companions) or by plot (eg. Nature of the Beast) per game. You may click on any tile to drill down into a selected theme or plot. Use the drop down menu to select either Dragon Age: Origins, Dragon Age II or Dragon Age: Inquisition. Decisions you make in the Tapestry will be exported into Dragon Age: Inquisition as part of your selected world state. Click on any tile to drill down into a selected theme or plot. Select a tile until it comes paired with a question. From there, you'll be given the option of deciding what decision was made at that specific plot point. Customize as much or as little of the Tapestry as you like. The Keep will automatically adjust your world state accordingly using its auto-solveralgorithm. You will see the auto-solver pop-up if you make a choice that is in conflict with one (or more) choice you made previously. Once you've made a decision, the name plate on the tile will turn white so you can keep track of the changes you've made. When the auto-solver must change a choice you previously set, a list of those impacts will be displayed in a pop-up. This contains a summary of all the changes the auto-solver must make to allow you to set a particular choice. It's up to you if you'd like to continue and make the highlighted changes, or choose a different decision. To share the world state you currently have loaded in the Tapestry, click the globe icon located in the upper right corner of the header bar. First, make sure the friend you wish to share your world state with is your friend in the Keep. To add friends, go to the tab with the person icon and type that friend's EA (Origin) username in the search field. It may take some time for them to appear in your friends list. Then, go back to the first tab with the globe+pen icon and click the 'Share' button. A pop-up will appear. Here, you can add or edit the world state's title and description, and select the friend you want to share it with. Once shared, your friend will receive a notification and be able to add the shared world state into one of their available slots. The Career section will keep a record of what you've done, what you own, and where you've been across the Dragon Age world by connecting and syncing with your EA (Origin) account. It will also record your accomplishments, rewards, and any progress through the DLC expansions associated with each game, along with a section for Dragon Age Keep achievements. Open the section using the left-hand menu. You'll immediately be able to see your progress in accumulating items for each Dragon Age game, as well as the Keep. Clicking on an individual tile will bring you to that particular section. You can also view sections by game using the dropdown menu in the upper left corner. To move between a game's sections, use the arrows on the right and left of the screen. After drilling down into a section, you'll be able to see all items you have (and don't have) for that particular category. By clicking on any item you can learn more about it, as well as how to find it in-game and/or unlock it (if necessary). If an item you own appears to be locked, such as a DLC or reward, you can unlock it manually. Click on the achievement, reward, or DLC item you'd like to unlock. Moments later, the item will become unlocked for you. The item will then appear and remain as unlocked forever in the Keep. The Keep recognizes your items on a platform basis if multiple platforms are connected to your EA (Origin) account. 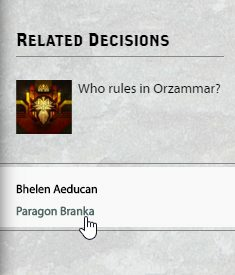 You can see which platforms are connected to your account on the Account Check page, or by clicking the question mark in the item's pop up window. Click on a different platform under 'Connected Platforms.' You can then begin the unlock process again. These achievements are rewards for using and unlocking things within the Keep. They don't affect anything in-game. They're just to add a bit of fun to your Keep experience! And yes, you can manually unlock them too. You can now read and collect Dragon Age Dark Horse Digital Comics from the Keep! By authorizing the Keep to use your Dark Horse account, you'll be able to read the Dragon Age comics you already own and purchase new issues from the Keep. Next, you'll need to authorize the Keep access to your Dark Horse Digital Comics account. If you don't have an account, you can create one at this stage. To log in, click the eye icon above the comic, or the 'View' link below it. This will open a pop-up. Click 'login' to log in or create a new account. You'll be re-directed to the Dark Horse Comics login page. Follow the steps on the page to log in or create an account. After you've completed the sign in process, this message will appear. Check the box and hit submit so that the Keep may display your Dragon Age Dark Horse Comics titles correctly. Once you're logged in, the Dark Horse Comics site will remain in the Keep. To see your Dark Horse comics in the Keep, simply click on 'All Titles' in the upper left corner. Now you're ready to get reading! After you've authorized your account, you'll be able to view and read your Dragon Age comic collection. Comics you already own are marked with the red flags. To quickly switch between comic series, use the dropdown menu in the upper left corner. If you already know what you're looking for, use the search bar in the upper right corner. If you'd like to read a comic you own, you can search for it using the methods above, or just browse using the right/left arrows on the page. When you've found one you want to view, click 'Read' or the eye icon. This opens up the reader view. Use the arrows at the bottom left and right corners to flip between pages. Use the tools in the top right corner of the reader to toggle the view to your preference. If there's a title that you don't own, you can easily purchase it within the Keep. First, make sure you're logged in to your Dark Horse Comics account(see steps above). Or, click the eye icon above the comic image. A pop-up will appear that contains a link to buy the comic that also lists the purchase price. After clicking 'Buy,' the Dark Horse Comics store will appear in the Keep. Follow the steps there to complete your transaction. Once that's finished, click 'All Titles' in the upper left corner to refresh the Dark Horse Digital Comics page. The comic you bought will now have ared flag showing that you own it. Click 'Read' to start a new adventure! If you're having trouble loading or purchasing comics from the Keep try using the section in Chrome. If you've logged in with one Dark Horse account and want to switch accounts, log out of your account on the Dark Horse Digital Comics site, then log out of the Keep, log back into the Keep, and follow the steps above to authorize a new account. If you've ever wanted to display the gorgeous Dragon Age Keep art on your walls, you're in luck! We've partnered with CanvasPop! to bring you high quality prints of your personalized tapestry or custom tile collage to hang in your home. If you'd like to print your tapestry (or part of it), log in to the Keep and load an existing world state or create a new one. Click 'Print' in the upper right corner. Next, a pop-up window will appear with some customization options. Don't worry, you'll be able to make further edits later on. Use the dropdown menu to choose whether you'd like to print your entire tapestry, or only one game section. Select a canvas or a framed paper print. Both styles are high-quality prints that look great on any wall. Once you're satisfied with your choices, click 'buy now' to proceed to CanvasPop! Here, you can further customize your print by swapping out different tiles. Just hover over a tile and the 'Change Image' button will appear. If you're not satisfied with the tapestry layout, simply scroll up and select a custom size and layout to create a totally new print using Keep art! You can add any art tile available in the Keep to your tapestry! When you're satisfied with how your tapestry looks, hit 'done designing?' to proceed. Here, you can check to make sure everything looks the way you want it before you purchase your print. Can't wait to show it off to your friends? You can also share a preview image to social media using the 'share' buttons located further down the page. After you've chosen your frame or other display style, you're ready to buy your very own Dragon Age Keep tapestry print. Don't want to print your Keep tapestry but still want that art hanging on your wall? We've got you covered. Visit http://www.canvaspop.com/dragon-age to get started on creating your custom print! OR, if you've already chosen a print of your existing tapestry but changed your mind, just scroll up and select a custom size and layout to create a totally new print using Keep art. First, select whether you'd like a canvas print or a framed paper print. Then choose the size of your print from the dropdown menu. Next, select the layout of your custom print. The amount of tiles you're able to add to a collage may depend on the size of the print. Afterwards, select what style of border you would like. After you've made your choice, now you're ready to start adding your favorite Keep tiles! Click 'select an image' over any spot to open the tile picker. Click on a desired tile to add that image to the slot. Review your print and make sure it's perfect. You can always return to the previous screen to make more changes if you like. Next, choose your frame and add your print to the online cart! The world of Thedas has a long and storied history, and more of it is uncovered with every new Dragon Age game, book, comic and movie. To help you keep track of everything that's happened so far, we've added a new section to the Dragon Age Keep! Just open the left-hand menu and select 'World Lore' to get started. 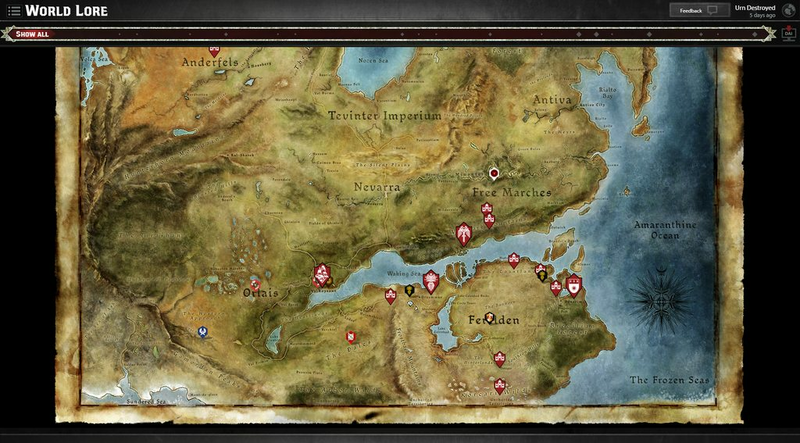 Once you've entered the World Lore section, you'll see a map of Thedas filled with pins, and a timeline at the top of the page. Use the wheel of your mouse (or swipe on mobile) to zoom in and out of the map. The timeline button will say 'Show All' on the far left. 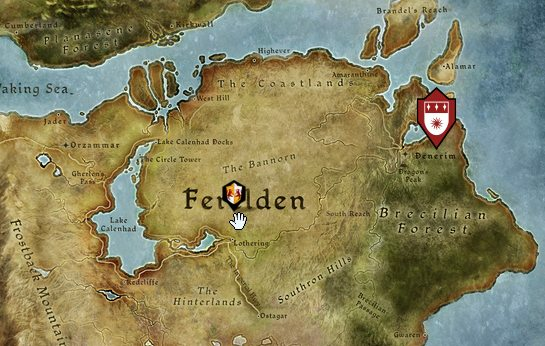 Leave it here to explore every event and location on the map from the beginning of time to the Dragon Age. To go through Dragon Age events only, click and drag the 'Show All' button to scrub through the timeline. As you move the button, pins will appear if an event is happening at that specific time. Click on a pin to see all associated events. You may click on a visible pin at any time to dive deeper into events happening at that location. Click on a tab to see its contents and read more. Click on an event to read a description of it. The location tab contains a brief history of the place where the event occurred. If there's a number under the event name, that indicates the year it was founded. The characters tab has descriptions of all prominent characters related to the event. 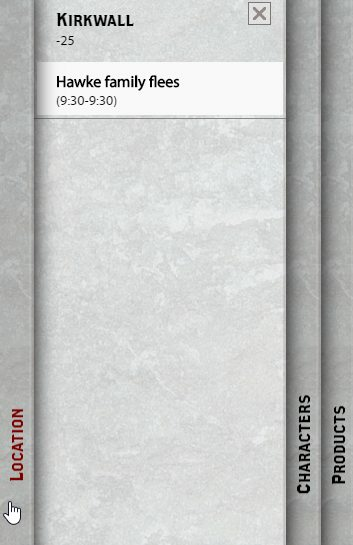 The products tab indicates if this event has occurred in one of the Dragon Age games, books, or other media. Clicking the images will take you to an external page where you can learn more about them. 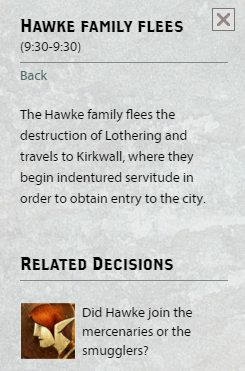 Any related characters or decisions in the Keep will appear underneath the primary description. You can click on these to learn more about their role in the Dragon Age universe. I know more things have happened in Thedas. Where are the rest of the events? The World Lore section of the Keep will continue to grow as more events, locations, and characters are fleshed out. 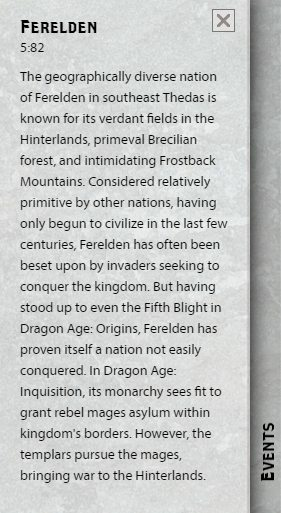 The events currently featured in this section are a good starting point for anyone who would like to know more about the Dragon Age universe. What about Dragon Age: Inquisition? This feature tracks the history of Thedas, and the events of Inquisition are still fairly recent and fresh in everyone's minds. However, they may be included at a later date. Why are there a few events in the wrong location? This is temporary and will be rectified in the future when the World Lore feature is expanded. These events were important enough to have in the section, but the specific location where they occur haven't made it in yet. The Interactive Story Summary (ISS) is your personal Dragon Age story come to life. Follow the adventures of your Warden and Hawke in an animated tale narrated by Varric Tethras (voiced by Brian Bloom). Watch and listen as he takes you through all the events of Dragon Age leading up to Inquisition. The ISS will appear after the first time you log in to the Keep, once you click the 'Watch Your Story' button. You can go back and re-watch your ISS at any time by loading the appropriate world state into the Tapestry, clicking the globe icon in the upper right corner to open the secondary menu, and then pressing play. Once the ISS has started playing, there are a few controls located in the bottom right corner that you can use to customize your viewing experience. To toggle music, voice over, and sound effects on or off, press the music note icon. To turn subtitles on or off, press the speech bubble icon. To stop and start your ISS, press the pause button. You can also skip ahead or go back to different chapters in the story using the reverse drop-down menu. You may exit the ISS and return to the Keep at any time by pressing the 'X' in the upper right corner. If you like, you can sit back and relax while your ISS plays. Or, you can change the events of the story in real-time. Periodically throughout the story, you'll see an 'Edit Choice' button appear in the upper left corner of the screen during major plot points. Click this button to change the outcome of the event in real time, with your changes playing out on screen. Making a choice in the ISS will also change the corresponding tile(s) in the Tapestry to match your decision here. After you've made a choice and approved the answer, the ISS will resume playing as normal. There are a few different ways for you to share your ISS. A direct link is provided for you to copy and paste, or you can share to a particular social platform by clicking the corresponding icon. Note: you do not have to be logged in to the Keep to view a shared ISS, but if you'd like to save the world state associated with it, you'll have to be signed in first. The Last Court is a text-based RPG from Failbetter Games (the creators of Fallen London and Sunless Sea) that you can play in your browser, and access exclusively through the Dragon Age Keep. Where can I find The Last Court? Open the left-hand menu in the Keep and select the game. The Last Court will appear in a new tab in your browser. Will it be available in other languages? The Last Court is available in English only. Do I have to pay to play The Last Court? No, the game is free-to-play. If you would like to speed up time in the game or gain additional movements, you can purchase ‘Dawn’ (the in-game currency) to do so. However, it is not necessary to buy Dawn to complete the game and you won’t miss out on any content if you don’t purchase Dawn. Dawn is the name of the in-game currency that is available for purchase. Once you are out of actions, you can buy Dawn to keep playing immediately instead of waiting for your actions to replenish. You can also use Dawn to move forward to the next market day before the 24 hour time period has ended. How long does it take to play The Last Court? Without using Dawn to speed up time, the game takes approximately seven days to complete. You start the game with seven market days, and each day lasts a full 24 hours (real time). Wait, how do market days work? Market days are triggered each new day you log in. So if 24 hours has passed since you last signed in to the game, a new market day will appear. For example, if you start playing and then don't come back for two days, you'll be on market day six (the next chronological day) and not market day five. Will this affect anything in the Keep or Dragon Age: Inquisition? Some choices you make in The Last Court will be written to the Keep (you won't be able to see them yet), but these do not affect Inquisition's story or plot. However, upon completing The Last Court, this opens up two war table missions in DA:I. Finish those missions and you'll be rewarded with an extra Skyhold customization option! It says my decisions are being recorded in the Keep. Where can I see them? We're recording some of the decisions from The Last Court and storing them for you. We're still working to add these into the Keep for a future release, and will let you know when this feature is available.